One of the biggest presentations of Meghan McGee's career so far was also the shortest. 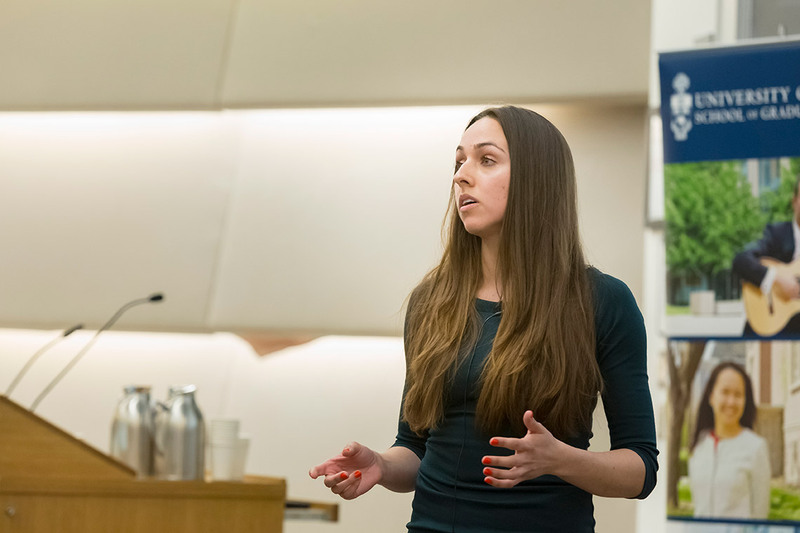 As part of a competition, the PhD candidate in the nutritional sciences program had to explain her dissertation of more than 125 pages to a lay audience in under three minutes. McGee was the winner of the University of Toronto round of the Three Minute Thesis Competition, collecting a $1,000 prize and moving onto provincials at York University on April 19. The competition challenges Canadian doctoral students to present their research in a compelling way to a panel of non-specialist judges. Her work focuses on improving the health outcomes of premature babies by using donor breast milk. Each year there are about 1,500 low birth weight babies born in Ontario. About 70 per cent of mothers can't provide enough breast milk, so they require a supplement, McGee says. But it isn't yet known whether it's better to feed premature and underweight babies pre-term formula or donor breast milk. “We know that when babies come a bit too early or too small, they for some reason have an increased risk of becoming obese in later life,” McGee says. McGee's research – conducted under the supervision of Deborah O'Connor and Dr. Jill Hamilton at SickKids hospital – was a followup to a clinical trial done with babies over five years ago. McGee assessed the same children's diet, physical activity, cognitive skills and body composition at 5½ years old. Scientists are still trying to understand why donor breast milk may be more beneficial than pre-term formula, McGee says. Once someone's body composition is altered in early childhood, she adds, it's very difficult to change later. “If we can intervene in early life then hopefully we can try and reduce the risk,” she says. There is only one donor breast milk bank in the province, the Rogers Hixon Ontario Human Milk Bank at Mount Sinai Hospital. The bank collects milk from lactating women, pasteurizes it and distributes it by prescription to medically fragile babies in neonatal intensive care units across Ontario. Not all these details could be squeezed into McGee's three-minute presentation, of course. When she was practising for the U of T finals, she didn't bother presenting to her lab group and instead explained her research to non-experts like her parents and younger sister. She watched for signs of boredom or confusion: blank faces, yawns and people checking their phones. At the U of T competition, she was the second last to present. Her nerves almost got the better of her as she waited her turn and listened to the other finalists. But, partly inspired by a TED Talk on power poses, she found her confidence before taking the stage. The other U of T finalists were Melissa Paquette-Smith, in psychology, and Jielai Zhang, in astronomy and astrophysics. Paquette-Smith's dissertation focuses on how growing up in a linguistically diverse community like Toronto influences a child's friendship preferences and speech. Zhang was part of a team that built the Dragonfly telephoto array, a multilens telescope capable of detecting extremely faint, complex structures around galaxies. Zhang led the development of the data-processing software for the telescope and used Dragonfly to search for undiscovered stars – and she found some in spiral galaxy NGC 2841, further out from the centre of the galaxy than expected. “We’re very proud of the work that Meghan and the other competitors have done,” says Luc De Nil, acting dean of the School of Graduate Studies. “They’re working on fascinating projects, and answering important questions, but they’ve also learned how to explain why their research matters in terms that anyone can understand.